It’s time to start breathing fire. Your big goal: Your first goal is to complete the first 21 days of Firebreather Fitness. We recommend everyone start with the 21-Day Beginner Program, which gives you the chance to learn the Firebreather Fitness methodology. Focus on your daily micro-goals: the daily exercises, practices and workouts in the training schedule. Begin Your Mental and Spiritual Journey: Most of the athletes coached by Greg Amundson agree that their mental, spiritual, and emotional progress is just as formidable as their physical gains. Power Nutrition: Support your training with the Zone nutrition protocol. This is outlined in Chapter 6. The Training: Firebreather Fitness will begin with gymnastic conditioning, then weight lifting. Controlling your body in space and time is crucial before adding weights to the equation. Workouts are conducted at a percentage of maximum repetitions and weight, which means your training will be personalized to your current ability. It also means your Firebreather Fitness program is a living, breathing program, designed to adapt to your conditioning level. Level up: Use the Firebreather Standards to measure your progress. Think of these a little like Karate belts. Start with an “empty mind” and fresh perspective, become a student of the Firebreather, and then progress through Levels 1, 2, and 3. When you’re ready for the upper and elite ranks of the Firebreather Fitness program, return to this website, where we plan to release Levels 4 and 5. Let’s take a little deeper look at each step of Firebreather Fitness. We recommend everyone start with the beginner program. 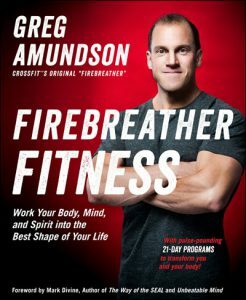 This gives you a chance to learn the Firebreather Fitness methodology. Each level builds progressively upon the last. Only advance to the next level of the program if you are able to complete all workouts with the prescribed weights, repetitions, and percentage requirements. Keep in mind that as your strength and physical capacity increase, each program will become more challenging. Therefore, even the beginner program, if repeated continually over a year, will get progressively more challenging. This is the beauty of the Firebreather Fitness program: It’s a living and breathing program that adapts to your conditioning level. Plans include your physical workouts along with a basic set of rituals to weave into your day: first words, meditation, box breathing, and positive affirmations. Give the mental and spiritual practices a shot for 21 days. The plans include several mind and spirit practices to complement your daily physical workouts. Think of these practices in a linear fashion, like a handrail that is leading you through your day. First words and meditation are terrific ways to begin each morning. These practices set you on the road to success and help you connect with your higher self, your unique purpose in life, and with God. Box breathing and affirmations help focus your energy and willpower for your workout of the day. During your workouts, discipline yourself to pay attention to your breathing and continue to repeat your positive mantras and affirmations. When the going gets tough, refocus yourself by committing to your purpose, and embrace the work set before you. In the evening, adopt a habit of journaling, recording impressions of how the process is evolving. Reflect on your biggest accomplishments of the day, and write three things you are grateful for. You are developing the Firebreather mind-set: being optimistic even in the face of great opposition and challenge. In just a few days, you will see solid progress in your physical, mental, and spiritual fitness. By the time the 21 days are up, you will notice a profound effect on how you view yourself and what you’re capable of in life. Gymnastic conditioning first, then weight lifting. Note that many of the weight lifting skills take place after your gymnastic conditioning. This is crucial to the philosophy of the Firebreather, which involves maintaining strength at a high heart rate. Just ask any military operator or law-enforcement officer, and he or she will confirm that in critical moments when you need your strength, you will need it at a high heart rate. Your training should reflect and prepare you for the demands of life! Completing the first 21 days of Firebreather Fitness is your big goal. To get there, focus on the daily goals. If you are new to these movements and practices, you may at first feel overwhelmed or a little intimidated. But don’t think about the 21-day plan as a whole. The program offers an excellent opportunity to practice the power of microgoals. Commit to the big goal of completing the plan, and then narrow your focus to the task list for Day One. The discipline to take life one moment at a time, and to remain aware and committed to living in the present, is the Firebreather way and the skill of a warrior. Therefore, take these workouts and practices one day at a time, trusting in the compound effect and long-term benefit the program will provide.